Had a packed day out with one of Erika's friends. Just a few random pictures of the early evening sky on arrival back in Kentish Town after work. It was noteworthy because for the first time I'd noticed I was arriving home in mostly daylight. Took advantage of my last night of temporary bachelordom for a bit of a blowout with the gang at Rules. Chie and Erika went off to Grenoble for a few days to visit one of Chie's friends and see the snow. In the evening I dined at Langan's. Afternoon off from parenting duties, went for a pub lunch. We didn't really have a plan for today, there was some discussion of possibly going to the zoo, but we suggested to Erika it might be a bit cold and after breakfast she decided she'd rather just stay in. I did my standard Saturday morning pop to the bakers to get things for breakfast. It snowed on and off, but never quite enough to settle. Cobbled together something based on cous cous for lunch, and for dinner we lazily got pizza from the new place just round the corner, which is actually fairly decent, but always deserted. In the evening Chie set out the Hinamatsuri dolls (they usually go up a few weeks before Hinamatsuri (girl's day) which is on March 3rd. Erika presented them with an offering of a Party Ring, which I thought was rather sweet. Chie was out for the evening. Chie and Erika go to an informal Japanese lesson once a fortnight which is held very close to my office. So that made for a rather convenient handover, and Chie could just go straight out from there. I took Erika back on the Thameslink (I'm not sure she's really used that much before), and decided to go to the Wahaca in Kentish Town, partly just because I couldn't be bothered to cook, but also thought it might help break up the evening a bit. As so often seems to be the case when we got there we found two of Erika's school friends were there. So I mostly sat at our table for two by myself, while Erika played in the corner with her friends. The kids all took their meals to the corner of the restaurant where they were playing, which initially seemed like a nice idea, but ended up with several of their dinners ending up on the floor (I am pleased to report Erika managed not to spill any of hers). Having had a bit of a dip in productivity the day before, today I made up for it with a particularly hard working day, and stay in the office until 8pm for a late meeting. Fortunately Erika goes to bed fairly late for her age, and I just managed to get back in time to read Erika her second story and sing songs to her until she fell asleep as I always do. Finally decided on the venue for my upcoming 40th birthday party today - after much deliberation I eventually just went back to the place I'd found for Andrew's party because they do dry hire, and were very easy going etc. So, that done, I sent out the invitations and so on. Not a very productive day at the office, and decided to just call it quits and leave a bit early. Went to Earth in an attempt to buy things to make a healthy dinner which Erika would like. Recently I've been infected, much to my irritation, by all this recent dogma that actually carbohydrates based on refined grains are bad for you (high glycemic index or whatever). This has been the cause of much consternation for me as a vegetarian, as I've tended to build meals around staples, and also because Erika really likes pasta, rice etc - the two things she's pretty much guaranteed to always eat. She will eventually eat just about anything we put in front of her (as long as it's not spicy) but it usually requires a fair bit of effort on our part to persuade her to finish her plate. So today as a compromise I bought wholewheat spelt pasta. There's no escaping the fact it isn't as nice as ordinary white pasta - and the inability to get it to a decent al dente texture would no doubt make an Italian weep. However, I just about managed to make a decent dinner out of it, with the addition of a tomato, aubergine, and courgette sauce, a bit of cheese on top, then gratineed under the grill. Erika ate it without much protestation. I still seem to have quite mixed feelings about King's Cross. Obviously the shorter commute over Victoria is something I appreciate, and I rarely ever use the tube now. The area itself though still needs a bit longer to really establish itself. Despite all the shiny new buildings the rough around the edges feel is still very much there, and most of the new restaurants etc are just outposts of chains - mostly smaller post-hipster chains that are confined to London - but they're still chains. The food at the new office has been a big disappointment, and has made me quite cross given the amount of money that was splashed on building the place. The end result is all style over substance - cafes that are designed to look good in the photos posted on social media, but actually produce really samey repetitive cuisine, and quite a lot of it actually just plain bad. That coupled with the rather irksome nannying food labels they have at work meant that at the start of this year I decided to just stop eating lunch at the office altogether in protest. This has been quite a lonely endeavour, on the downside, although I'm not completely alone in my opinions of the food, must people just seem to put up with it for the sake of convenience. So I almost always eat lunch by myself. Coupled with the fact I still don't have a team to work with locally means going to work is actually a pretty solitary existence, compounded by the fact we're all actually quite packed into the building, so I'm surrounded by people I don't really have any interaction with. Despite having been with my current employer for a decade now, I feel I know fewer people in the office than ever. Today's lunch outing was to a greasy spoon cafe, which, on inspecting the menu, I had the impression was slightly in the vein of the Regency Cafe - probably having some Italian heritage, as many of these kinds of cafes in London do. So I sat outside - as it was just about a nice enough day to do so - and tried their penne all' arrabiata. The pasta was overcooked - of course - but the sauce was decent enough. Living as we do in a flat in a Victorian house, damp seems to be inevitable. We'd noticed a damp patch develop on one of the internal walls last year, initially had an independent damp surveyor come to take a look (having read that damp contractors are notorious for getting you to do a lot of additional work you don't necessarily need), but then subsequently had a very hard time getting anyone to come round to actually do the work. I must have tried to contact about 5 companies in total - admittedly most of them just by email, and not one actually replied. Possibly leading with "I've had an independent damp surveyor" in my email put them off. Anyway, I renewed my efforts recently and via a combination of phone calls (ugh, it's 2017 etc) and emails managed to get somebody to come and take a look to give us a quote this morning. In the evening I went for a "quick pint" with a couple of the usual suspects at the Bree Louise. I was left slightly irritated by it - I felt a bit pressured into going along in the first place, inevitably the "quick pint" turned into two or three, and then just at the point where I could no longer get home in time to help out with Erika's bedtime routine the other two declared they were going home to have dinner with their other halves. So I had incurred the debt of a full night out with Chie, having not been able to make any contribution to childcare, but had only really been out for half of the evening. One dreary January evening after putting Erika to bed, I'd sat on the sofa, rather bored and fed up, wondering if I could cheer myself up with a frivolous online purchase. So that resulted in my acquiring a Champagne sabre, obviously. Chie had invited one of her "mamatomo" round to ours this afternoon. The plan was that they were going to pick up our cot which we no longer needed, Erika could have a play with their little boy, and the husband of Chie's friend apparently rather liked beer, wine, spirits etc, so the grown-ups could have a drink or two while the kids were keeping each other entertained. This was therefore the first opportunity I had since getting the Champagne sabre to put it into practice. I had watched rather a lot of YouTube videos in preparation, had got my bottle of Nyetimber well chilled, and, perhaps slightly OTT, put on the safety goggles I use for trimming the hedge. A couple of things I like about the video - you can hear Chie saying (in Japanese): "I don't think it's going to work very w-" - and she was cut off before she could finish the sentence by the sound of the head flying off. Also Erika was surprisingly excited by the whole thing and was cheering and clapping on successful completion - at the risk of immodesty I actually got the impression she was proud of her ridiculous eccentric Dad, which was a great feeling. Our guests very politely displayed excitement and a sense of being impressed too, although I can't help but wonder if they left later on thinking they'd just fled a madhouse. Went for lunch at the Pineapple with Chie and Erika, just a few Saturdays back. Erika was again entertained by the pub cat who tends to just put in an appearance after opening time, and then makes himself scarce once more than a handful of people are in the pub. Erika had a play date this afternoon, and so I was left to my own devices for the afternoon. I decided to go for a stroll across Hampstead Heath, and it was a particularly nice winter's day for it. On arrival I met Cardo at the Holly Bush for a late afternoon / early evening drink, then back home for dinner. Picked up a couple of pizzas at the Kentish Town branch of Franco Manca on the way home for dinner. Erika finally went back to school today. Also this evening we marked "Setsubun" - traditionally the last day of winter in Japan, when the household is cleansed of bad spirits by throwing beans. First daffodils of the year (actually bought yesterday I think). In addition to tomorrow's setsubun this gave the sense that spring is theoretically on its way, although the weather of late still felt decidedly wintery. Erika was off school again today. She really didn't seem ill at all by today, but the school had requested all the kids who had suffered with the recent stomach bug to take extra time off to make sure they weren't still infectious. For lunch, I was in the mood for a veggie burger (a continual source of disappointment - I don't know why I continue to bother). So I went to "Prime Burger" in St Pancras station, where, my Google reviews tell me, I had last visited 5 years ago. It hadn't really changed that much, overall it was still OK at best, but I suppose it satisfied the craving to the extent that it reminded me they are never as good as I think they ought to be. For dinner, I seemed to be continuing my desire to eat unhealthily, and wanted to eat some kind of pie and mash type setup. I bought a selection of frozen pies etc in Waitrose on the way home, and in the end we had two types of vegetarian sausage rolls and a vegetarian toad in the hole. Again, at best it was OK, but it stopped me wanted to eat this kind of stodge - partly as a result of the reminder it's always a bit mediocre in the end - so I suppose we can say mission accomplished. Erika was off school today - she had gone back yesterday (she was very keen not to miss out on the school trip) but there had been a slight "incident" toward the end of the day, and they recommended she take another 48 hours off before returning to school. She seemed fine to me and Chie though, and as Chie was possibly getting a bit of cabin fever by this point she suggested we all go out for lunch. Erika said she wanted to have dimsum, so I took a long lunch break from work, got the tube down to Chinatown, and we had lunch at our favourite dimsum haunt, Joy King Lau. An old Chinese lady was sitting at the table next to ours when we arrived, and she seemed to take a particular shine to Erika. It turned out she had lived in Japan for a short time and could speak some Japanese. The restaurant in general seemed surprisingly busy for a weekday lunchtime - I suppose because of Chinese New Year - and there was an unusually jubilant air to the place. 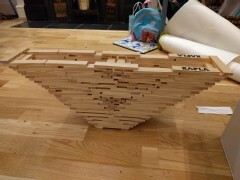 In the evening we played with Erika's Kapla blocks, and I made a structure with a big overhang on both sides which I found very satisfying. Erika was determined to go back to school today so she could go on her first school trip - to the local city farm. She seemed just about well enough to us, and there hadn't been any stomach bug related unpleasantness since Saturday, although she had generally seemed a bit weak and worn out for the couple of days inbetween. As it happened they wanted some parents to go along as volunteers to help wrangle the kids, which was good as Chie could go along and keep an eye on her. Apparently she was mostly OK on the trip itself, but when she got back to school there was a bit of a toilet related incident which prompted the staff to phone Chie and take her home a bit early. In the evening we had pasta for dinner, trying to make something fairly simple and bland that Erika was guaranteed to eat, as she hadn't really been eating much since Saturday. Erika was off school today. There had been no more, um, "obvious" symptoms of her stomach bug since Saturday, but she seemed a bit weak and tired and so we decided she probably needed another day to recover. Chinese food for dinner as usual on Monday, although Erika didn't really eat very much. Stayed in all day. Although Erika was over the worst of her stomach bug, she was still pretty frail, and didn't seem to want to go out at all today. So we stayed at home, just having a very quiet time of it. Went to Cheltenham for the Festival Trials Day today, an excuse to don tweeds and drink Champagne. There seems to be some historical precedent to Erika being unwell when I go to Cheltenham, and just minutes before I was about to leave this morning, she threw up. There had been a stomach bug going round at school so we weren't wholly surprised. I discussed with Chie whether I should still go or not, but Chie kindly persuaded me it would be a waste not to, as the tickets etc were already booked, and it only really needed one of us to be there to take care of Erika. This month had been rather a difficult one for me, and, if I'm honest, I'd spent quite a lot of it feeling really rather depressed. Earlier this week had been bonus day and I always find that a rather demoralising anti-climax because nobody at the office seems to want to celebrate it at all. Another year's constant drudgery, and this really ought to be the pay off, when people blow off a bit of steam etc... but it's always a completely normal day at the office, nobody even talks about it. I completely understand that as problems in the world go, the notion that my bonus day was insufficiently jubilant is hardly going to seem very worthy of anybody's sympathy... but I seem to struggle more than most with routine and repetition and the sense that life is this inescapable treadmill, and I for one would find it all a bit more bearable if milestones like this were celebrated a bit more. There seemed to be no appetite this year to do anything among my work friends - perhaps partly because of last year's outing which had not ended particularly well for all attendees. This contributed to me wanting to go to Cheltenham today, in addition to try and brighten up what had been a pretty miserable month. As has become the norm, nobody I know seemed keen to join me - apparently tweed, country air and Champagne just isn't really that much of a draw for any of my friends. The rather protracted explanation above of the background to today's outing is an attempt to justify why, once I got to Cheltenham, I rather overdid it. I suppose I felt kind of frustrated and alienated at the lack of friends with more similar interests, and the general state of misery I had spent much of January in. I don't think I could rationally have believed it, but some kind of naive optimism had me thinking that just maybe if I stand around in my tweed suit, drinking lots of overpriced Champagne, I might somehow fall in with a crowd of likeminded souls, and suddenly be transported to some magical Waugh-esque world of Bright Young Things, or somesuch. Of course that didn't really happen. The people who were at the next table to mine very politely made a bit of conversation, presumably out of sympathy for the sad individual drinking Veuve Clicquot alone. I was there for about 4 hours, and barely left the bar for the entirety of that time. The actual racing has always been kind of a sideshow for me - it was always much more about the opportunity to brush shoulders with the tweed wearing classes - but today in particular I barely noticed the races even happening. I'm reminded slightly of a title of a Douglas Adams book - The Long Dark Teatime of the Soul. I think that's probably a reasonable description of this afternoon. It would be hard to say I really enjoyed myself, I just let loose and overdid it and there was kind of no point to it. However, trying to find a silver lining to the cloud, I think it did somehow mark a turning point, and once I'd got over the sense of guilt in the ensuing days at the stupid excess, the dark mood with which I'd been beset for most of January did start to lift a bit. Perhaps there was just something I needed to get out of my system. I got back in time for Erika's bedtime, and although all of the vomiting as a result of her stomach bug had been contained within the time I was away (which added to the sense of guilt) she still felt pretty bad, and it was a bit of a rough night. I wasn't really a great deal of use, being somewhat the worse for wear myself. Not really my finest hour by a long shot, but I was able to make a meaningful contribution to parenting again from the next morning onwards. Went for lunch with a couple of people from the office to Dishoom in Kings Cross. Owing to my ongoing stupid and inept protest about the food at work, lunch has been a mostly solitary affair this month. So today's lunch made for a nice change from that. Despite that for some reason toward the end of the day I started to become quite irritable and short tempered. Chie and Erika were at their bi-weekly Japanese lesson which takes place very close to my office - it has become the norm that I go and meet them there when they're doing that and we go home together. Today though I was determined to just get home as quickly as possible, and Erika didn't seem to want to leave straight away, so I went off by myself in a bit of a huff. Went to Earth on the way back home to buy some things for dinner, although I don't recall now what we actually ate (writing this several weeks after the fact). Possibly some kind of nabe? I'd bought a new tweed suit last weekend, and as always the trousers needed to be finished off, so today popped over to Walker Slater to pick it up (also had a waistcoat of another tweed suit altered at the same time). I was in the mood for pizza, so went into a branch of Icco / Ecco / whatever you call those cheap pizza places on the way there. In the evening made pasta with a tomato, olive and caper sauce. I quite liked it but possibly a bit rich for Erika. Took Erika for a stroll across Hampstead Heath in the morning, then to another of her friend''s birthday party in the afternoon. Return visit to the Regency Cafe for breakfast after a long hiatus. Pottered around St. James's in the afternoon. A few more pictures of the view from my office. Managed to get hold of another crate of my favourite Gevrey Chambertin - Domaine Fourrier Vielle Vignes 2011. A couple of random photos. Got my Champagne Sabre in the post today. Erika went to a friend's pirate themed birthday party. Lunch at the Pineapple followed by a trip to London Zoo. Just one picture of a Gevrey Chambertin cork. A light dusting of snow in London. Started reading Empire of Booze, a Christmas present from Robert. Received Erika's new Stokke chair, and rather incongruously bought some vegan wine from the butchers. A return visit to Bankside Wassail. Took Erika for lunch at Wahaca, then later on to see some of her friends at the Rose and Crown. Some Nyetimber at the office to usher in the New Year. Picked up new suit from Dashing Tweeds. Just a picture of a comment in Country Life I found amusing.